We are pleased to announce that we are now part of Kent Intensive Driving School! You can still contact us directly and book using our site. 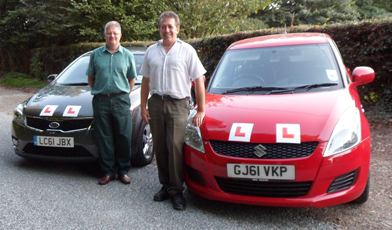 We started driving tuition in Maidstone in 1990 and have expanded throughout most of Kent. Specialising in Intensive driving courses, we offer a range of courses to suit most individuals' needs, we provide courses for the complete novice to someone who might need further tuition after failing a test. All of our Instructors are fully qualified, registered approved Driving Instructors and have all had a Criminal Records Bureau (CRB) check. We have male and female instructors and provide manual and automatic courses, just let us know when contacting us what sort of course you are interested in. Our intensive driving courses are in the following areas: Maidstone, Medway, Canterbury, Gravesend, Sittingbourne, Isle of Sheppey, Ashford, Sevenoaks, Tonbridge, Sevenoaks, West Malling, Staplehurst, Lenham, Headcorn, Biddenden, Cranbrook and the whole of Kent, we specialise in intensive driving courses. When choosing a course please make sure you have enough time to get to test standard without putting pressure on you or the Instructor. If you are not sure then why not take advantage of our assessment lesson? We hope you find the following pages helpful. If you find you require more information please do not hesitate to contact us. Paul was the best driving instructor I’ve had, very patient and easy to talk to. I learnt more in 5 days than I did in weeks of hourly lessons. Thank you so much for all your help, I’ll be sending business your way as much as possible! Contact us - would you like an assessment lesson or introductory lesson? Take your chosen course with test. Pass plus if required or, if you were unlucky, re-book test and have any further lessons as required.